Some sample questions.Here are some good questions that will help you move into a conversation about spiritual things. Be sure and listen carefully to their answers. And be prepared to share your own answers to these same questions as well. Who is/was Jesus Christ (i.e., his identity)? What do you think was significant about his life? What was he trying to accomplish (i.e., his purpose)? What do you think was significant about his death? A lot of people claim that Jesus rose from the dead and is alive today. What do you think? Jesus said a lot of interesting things like, I am the way and the truth and the life and no one comes to the Father but by me. What do you think he meant by these statements? What is humankind’s reason for being? What is your purpose in life? What do you think humankind’s basic problem is? Do you believe we are good or evil or both? What kind of solutions to this do you see? What kind of needs do you see in the people around you? What is your deepest need? How would you describe a real Christian? What exactly is it that makes one a Christian? What’s been your experience with Christianity? What’s your church background? What do you think it means to believe in Jesus? Why do you (or don’t you) believe in God? When did God first become real to you? How has your view of God changed since coming to college? What do you think God is like and where are those ideas from? Is he concerned about us? What do you think God expects of us? Many people say that if there is no afterlife, then life is meaningless. What do you think of life after death? How about the idea of heaven and hell? How would we get into heaven? 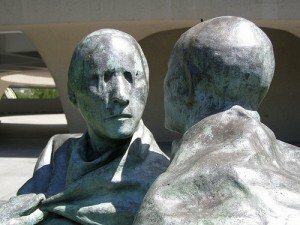 What is your basis for ethics? What absolute truths are there? Would you be interested in getting together to discuss what the Bible says about the issues we’ve been talking about? Source: Communication Skills for Evangelism – Evangelism – InterVarsity.org. Original article has moved. The point of questions is not a have a litmus test, but to create and continue conversation. 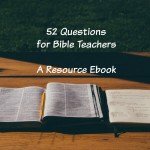 These questions can help that process. Print out this list of questions to use for your devotional time to reflect on your own faith. You are free to share, bookmark, repost, or email this list as you see fit. 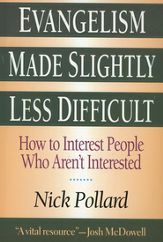 As mentioned in Saturday’s post I just finished reading Nick Pollard’s Evangelism Made Slightly Less Difficult: How to Interest People who Aren’t Already Interested (order your copy direct from Amazon). help you get uninterested people interested in Jesus, to reach people “who are simply not interested in hearing about Jesus because they are quite happy with their own views” (p. 31). 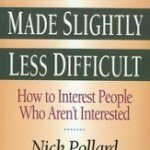 The subtitle makes it clear: How to Interest People who aren’t Already Interested. those who doing fine in life without Jesus, and therefore don’t see the need. To reach them, “we must help them become uncomfortable with their current worldview and then perhaps they will be” (p. 42). This is done in a conversational dialogue about worldview (which all of Ch 2 is about). Side Note: The best book on world view that I have read is Discipling the Nations: The Power of Truth to Transform Cultures, by Darrow Miller. Follow the link to get your copy from Amazon. In all of chapter 3, he explains that through the use of critical questions, you can help a person analyze their world view, take it apart, and examine it. The goal of such conversations is to expose the internal contradictions in the worldview. This form of debate may seems negative, but the goal is to search for truth. The starting point is to find out what a person believes. Conversationally, this can be done through the use of questions and sincere inquiries that are genuine. Then, after finding out what a person believes, make efforts at understanding their worldview (such as read books about it). With these two things, you are then prepared to know what kinds of questions to raise — to help the other person examine their worldview. 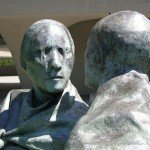 Analyze the world view — Is it true? a. Does it cohere? b. Does it correspond to reality? c. Does it work? Is this evangelism less difficult? 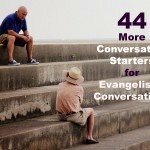 The rest of Evangelism Made Slightly Less Difficult goes on to examine worldviews, and help you think about potential conversations. have to be able to reasonably dialogue about them. I took entire courses in seminary on worldviews, read several books on worldviews. (A good example of an evangelist who understands world view is Ravi Zacharias of www.rzim.org.). Does worldview research and philosophical analysis come easy to you? Or, does it overwhelm and confuse you? This is where one needs to find a evangelism style to fit your personality. What approach would you use to engage this particular subset of people: those who are not interested?